Before I offer an update about the fresh items listed in the galleries (which may be found by clicking on the links at the top of the page) I wish to talk briefly about what has been happening in my world in terms of principles recently addressed in the posts. Let me explain with regard to the last post about complementary tensions in figures. 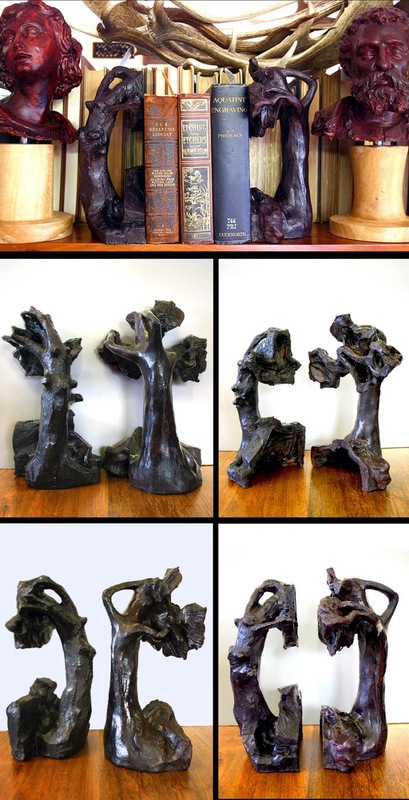 Twenty-one years ago I modelled in clay a set of bookends in the form of trees (see below) intended to express a personal state of angst with my world. At this point I need to clarify that this feeling was not a profoundly upsetting type of angst but rather a little angst surrounding the need that I actually have to “do” things. Fortunately, it was a feeling far removed from my present lovely circumstance, now that I have retired, where I don’t have to do anything that I don’t wish to—a state of absolute heaven! Getting back to my story, these modelled trees had been gathering dust on a shelf in my uni staff room waiting for the day that they could be used to prompt students suffering a similar emotional malaise to engage with the fine therapy of reassigning worries into objects. (Interestingly, no student took up the challenge of putting their inner feelings into sculptural forms in a meaningful way.) Getting back to my story once again, I was contemplating these dusty relics the other day and I decided to refresh their surface with my newly concocted recipe for lacquer. While I was applying the lacquered finish I had one of those special Proustian experiences—a reliving of past memories excited by seeing/smelling/feeling/hearing something in the manner that Marcel Proust experienced when he enjoyed a cup to tea while munching on Madeleine cakes. It arose when I was rubbing the surface of the modelled trees and my actions triggered an immediate gut reaction of literally feeling my old angst once more. On reflection, I now see that the triggered feeling—a feeling that was a bit like Munch must have felt when painting The Scream—was all about the tensions embodied in the tree forms. 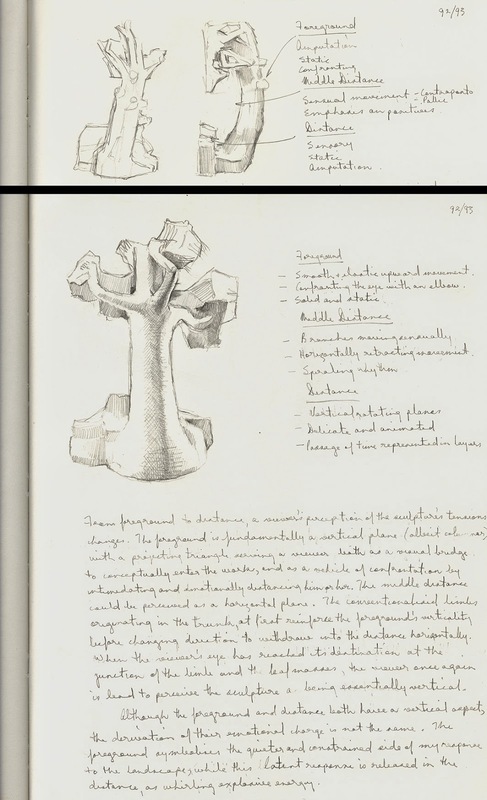 Moreover, when thinking back to the time when I crafted the sculptures I can recall the level of calculation that I originally engaged with to ensure that the tensions in the trees were “just right.” In fact, the process of transcribing feeling into the sculptured trees was thoroughly predetermined. It involved careful consideration about how the tensions should be encoded in the front/foreground of each piece and how they needed to be adjusted towards the back. Indeed, this thinking process is part in my sketchbook-journal jottings in preparation for making the tree-bookends as shown below. My memory of this very calculated translation of personal angst ridden tensions into the tree sculptures still resounds in my head and it is especially strong after rationalising in the last post how other artists use tensions in their figure drawings. I mention this niggling memory as last week I attended a series of performances at the Australian Festival of Chamber Music and I couldn't help thinking during the recitals about how tensions are encoded in music. What impressed me about the recitals was the difference that a pianist’s touch can make to my perception of tensions in a piece of music. For instance, one of the favourite pianists (and the festival’s brilliant artistic director), Piers Lane, has the remarkable ability to make the auditorium resonate with glowing rich sounds at one time and then in the next instant to physically suspend my breathing so that I can hear the lingering reverberation of a fading note. He is such a marvellous pianist! By contrast, one of the world’s rising stars on the keyboard and one of my personal favourites now that I have heard his playing on successive nights, Daniel de Borah, takes my mind to a three-dimensional field of sounds where I see/hear tensions between notes delicately cushioned in their allotted spatial zones as if de Borah were physically drawing in space. Fascinated as I was with his careful articulation of sounds in space I must add that there was another factor enhancing my involvement with listening: the scent of perfumes surrounding me in the auditorium. I do not know if smell and sound affect other listeners, but for me the smell of fragrances with notes of moss, woody decay and herbs really help me to visualise sounds and relationships between sounds very clearly. Moving on to the important topic about the fresh items listed in the galleries shown as links at the top of the page, I have some very desirable items to consider. In the Architecture and Ornament Gallery I have listed a stunning early and very rich etching (with engraving) by one of the very few female printmakers from the Renaissance still finding her way into the history books: Antoinette Bouzonnet Stella (1641–76). The featured print is part of a series of twenty-five plates published in 1675, titled: Entrance of Emperor Sigismund into Mantua. As a point of interest concerning this series, Sonja Hansard-Weiner, from the Spaightwood Galleries, raises the probing question in her review of the 2010 exhibition, Pomp & Power (see https://jps.library.utoronto.ca/index.php/emw/article/download/14868/11909 [viewed 17 August 2014]): Why did Stella commit herself to such a project? After all, as Hansard-Weiner points out: “some visitors to the museum might think the martial subject matter of the engravings an odd choice for a woman artist…." From my standpoint, after years of contemplating women’s interests, I believe that the subject material that many women artists are drawn towards—and of course I may be wrong (heaven forbid)—fits with Stella’s interest. Essentially, women like patterns; for instance, they tend to love the patterns of bark in trees (see my earlier post for a more lengthy discussion of this dangerous topic: Female Perception [http://www.printsandprinciples.com/2012/04/delasalle-female-perception.html]) or, as is the case with this print and the series in general, patterns involving textures that invite the hand to touch and explore them. Or to express this in a way that will probably offend many women (but said in a spirit of tongue-in-cheek): patterns that could be translated into doona/quilt covers. In short, I believe Stella enjoyed the eye-touch relationship of translating an endless procession of military folk into the flattened space of a bas-relief. In the Figures and Fauna Gallery is an etching by Kathe Kollwitz that has become, after many hours of close examination, one of my favourite prints. I would not claim that it exemplifies the typical Kollwitz theme of bitter war-torn suffering and resilience; nevertheless, every stroke in it bears the signature of an artist fully engaged in deep thinking and feeling. For me, the treatment of the print with its myriad of fine lines pictorially weaves the portrayed naked male figure with his immediate surrounding. Going further, I view the treatment as a superb exemplar of a haptic artist visually feeling her subject into an image. Moreover, if Antoinette Bouzonnet Stella’s choice of a triumphal entrance (or adventus) subject could be justified in terms of a female’s leaning to sensuous touch then Kollwitz’s print epitomises this leaning. In the Landscape and Flora Gallery you will find a botanical rendering of a banana tree that not only captures the scientific details of this plant, but also embodies—at least to my eyes—the hot and humid atmosphere of the tropics. This description of the effect of this print on the senses may sound implausible, as scientific illustrations are usually coolly objective and far removed from evoking any notion of felt experience, but this one does. Perhaps it is the richness of the inked impression, or the arrangement of the banana tree’s languidly drooping fronds, but whatever magical ingredient is in this image to trigger thoughts of heat, sticky banana sap and the continuous buzz of tropical insects, this print has it! What is also fascinating about this print is the inscription in the lower margin: “De DUDAÏM door Ruben gevonden. Gen. 30:14” [Dutch translation: The mandrakes found by Ruben]. Also freshly listed in the Landscape and Flora Gallery is what may be described as a mini exhibition of the marvellous prints of Adolphe Appian (1818­–­­­98). For me there is something eerie about the treatment of his chosen subjects. The way that he portrays trees, for instance, is full of spikes and an odd fusion of tight curves with long verticals and short horizontals. I would like to mention the word “mood” here, as it is perfect for explaining the dark feelings that his work often expresses, but sadly it has faded from the lexicon of phrases that “proper” writers use. Nevertheless, Appian’s images are ideal examples of how images can embody and project an emotional charge. In the last gallery, I have presented two Art Nouveau jugs that caught my eye some time ago as their design is so strong and captures beautifully the spirit of the period. 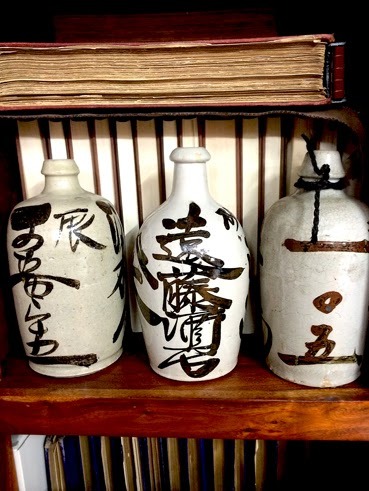 At the time I thought that I would become a collector of such jugs but my interest shifted to collecting ceramic Saki bottles featuring loosely laid calligraphy instead (see below) … and I do not touch alcohol at all! Fortunately I have run out of library shelf space so expect to see a crate of Saki bottles on offer soon.